We loved immersing ourselves in the glory, guts and spills of Australian racing history to tell the stories of Oran Park Raceway inside Oran Park Library. For 48 years, Oran Park Raceway was home to thundering events from the V8 Supercars and superbike championships to the Australian Grand Prix. In 2010, the raceway closed to make way for Oran Park Town, an award-winning master-planned community in southwestern Sydney. 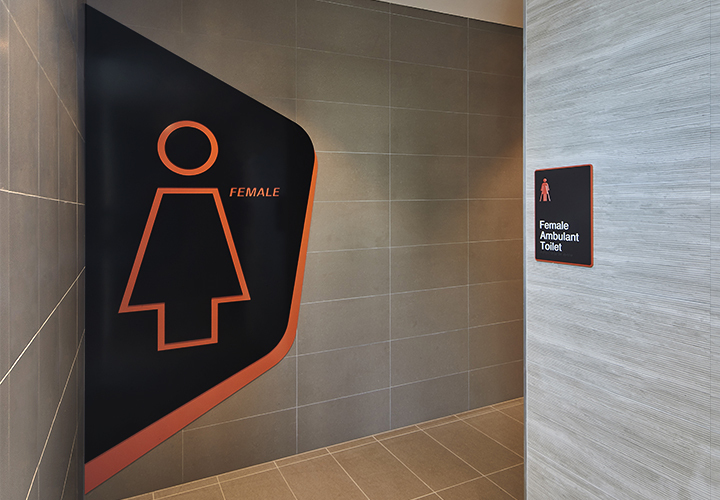 Designed by Brewster Hjorth Architects, Oran Park Library now sits at the heart of Oran Park Town. It opened in June 2018 as a new gathering place for the whole community. 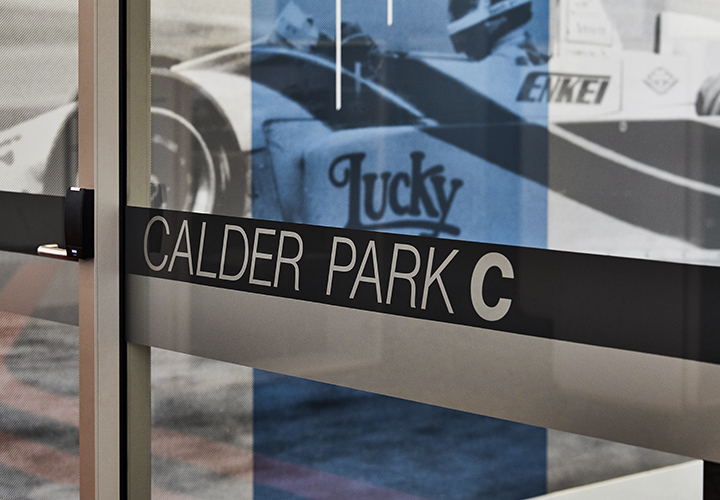 Working with Brewster Hjorth Architects, we set out to design signage and place making features that weave the story of Oran Park Raceway into the built environment so that future generations feel connected to its past. Our designs are inspired by the bold shapes and colours of race cars and race day posters, as well as the bends and straights of the track itself. There are tributes to Oran Park’s racing heritage at every turn. 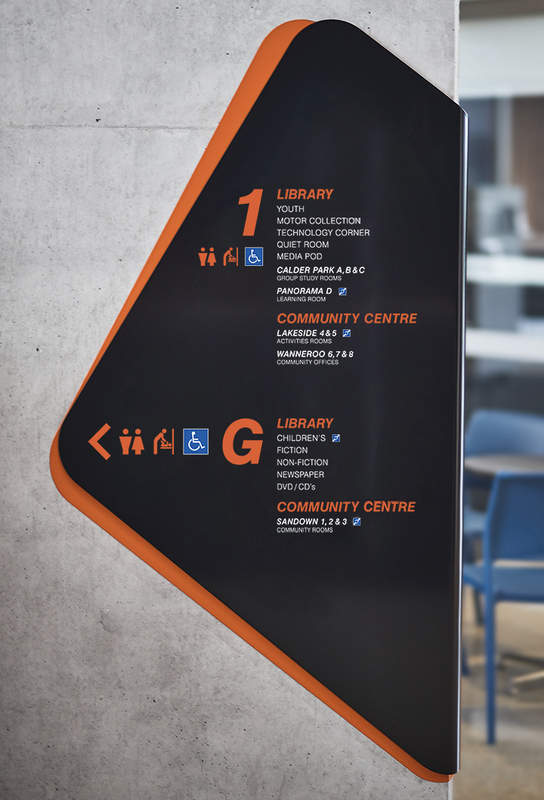 Even the directories mimic the curves of Oran Park’s infamous circuit with rounded corners and sharp orange edges that corner the walls themselves. 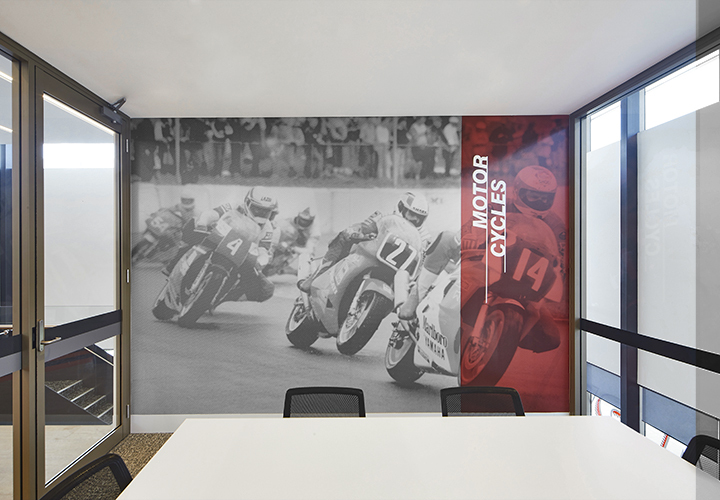 Inspired by the sheer sweat, guts and passion it took to win at Oran Park Raceway, our designs are rich with ‘racy’ graphics from racing stripes to a slanting, speeding typeface. 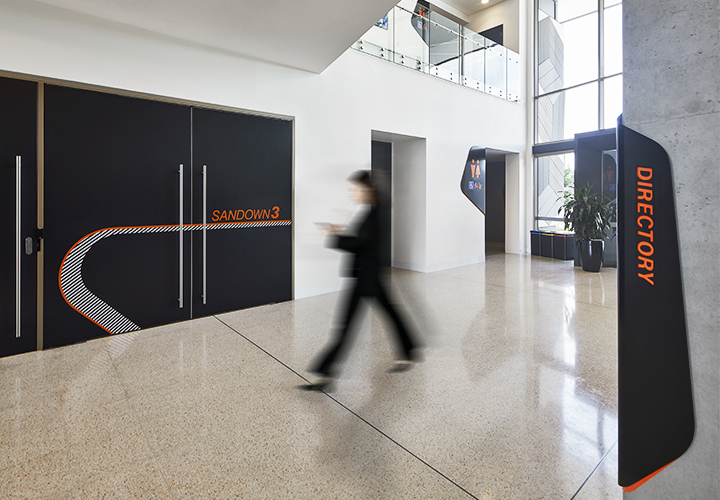 Our designers trawled through hundreds of photos to decide which ones might work best as super-sized graphics. We wanted to represent all the different kinds of races that took place at Oran Park from night racing to motocross. 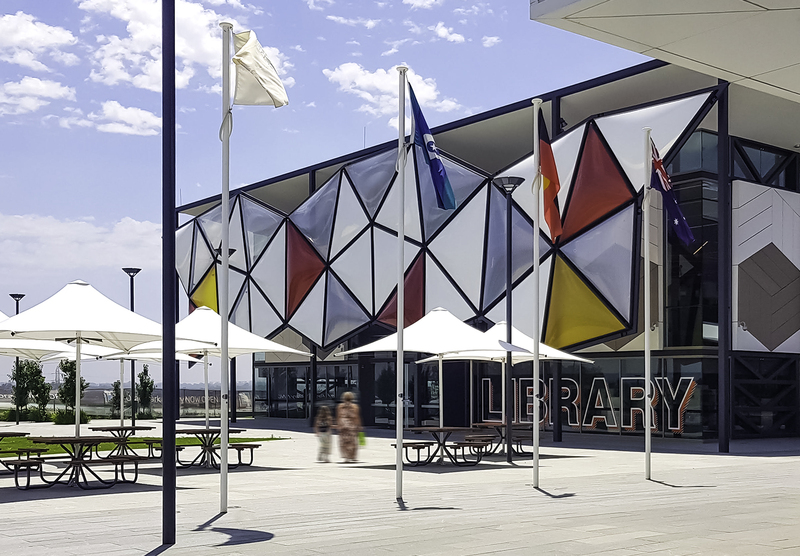 Since opening in June 2018, we’re delighted to report that Oran Park Library has won the prestigious Western Sydney Leadership Dialogue Outstanding Community Project of 2018. The award recognises Oran Park Library as a landmark building – a valuable community asset that is flexible enough to service generations to come. 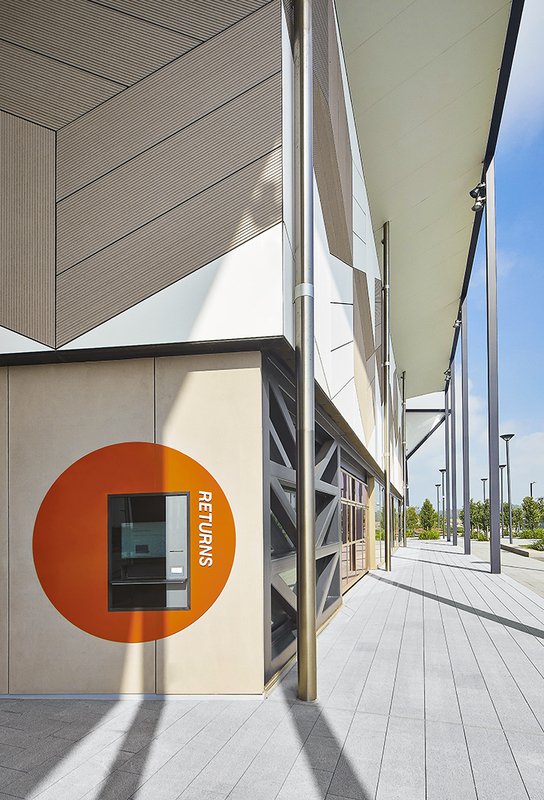 The library design was a combined effort between Camden Council, Landcom, Greenfields and architects Brewster Hjorth, with construction by ADCO Constructions. We’re immensely proud to be part of the team shaping the future of Oran Park Town, which 120,000 people will call home within 20 years.